Built new by Pullman and delivered on March 7, 1927 for the Oregon & California Railroad (O&C an SP subsidiary). On November 8, 1928 the car was renumbered to Southern Pacific Railroad (SP) #10040. Seating was reduced to 32 in April 1933. The car was modernized and seating restored to 36 in July 1937. 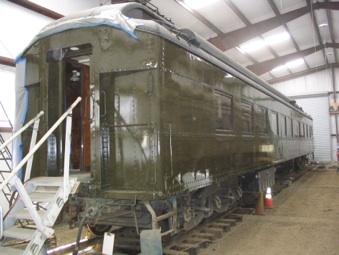 Waukesha air conditioning was added in 1939 and the car was assigned to the “Sunset Limited”. In 1951 the car was used on “San Joaquin Daylight”. The picture above shows the diner in the car ship in 2007 just after the exterior was painted. The picture below by Charles Smith shows the diner set up for dinner. Restoration is nearing completion. We still need to find the proper dining chairs for the car, but isn’t the interior beautiful!